Baeren Apple Lager is a 5% fruit beer from Baeren Beer, based in Iwate, Japan. It’s part of their autumn line up and can be found in both bottles and on tap across Japan. 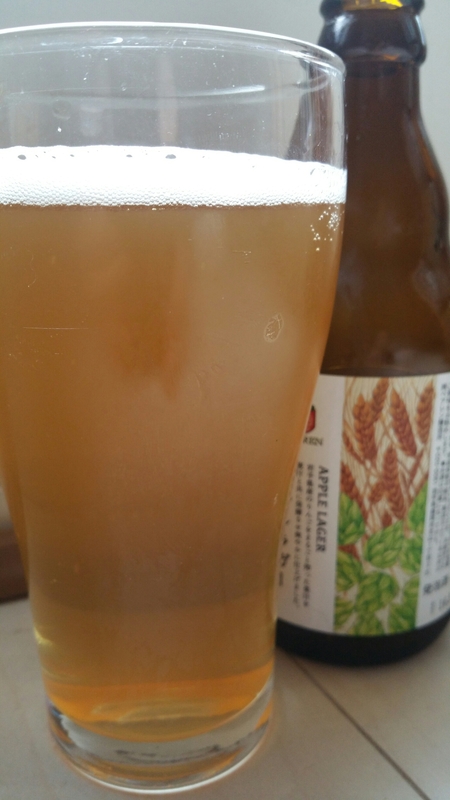 Baeren Apple Lager is brewed using locally sourced Iwate apples of the Sansa variety. A little known fact is Iwate is the third largest producer of apples in Japan behind Aomori and Nagano. Apples. Lots of them in Japan so why not make cider with them? Well Baeren do make a cider, though at the time of writing we’re yet to try it (nudge nudge wink wink). To be honest, the ciders I’ve had in Japan (not the lemonade kind!) have been pretty poor so I’m loathed to try it. It was much clearer than this picture suggests. Baeren Apple Lager poured out slightly hazy golden colour with a bright white head on top that came out and then collapsed as soon as I had turned around after taking this picture. There was also some brownish grey blobs floating around in the glass, which I assumed was sediment in the form of yeast from the bottle. Not the most appetising of sights as there was nothing on the label about Baeren Apple Lager being bottle conditioned. It had a slight apple-like aroma with a hint of booziness when it had warmed up, along with a strong malt caramel-like aroma as well – almost as if someone had put some apple juice into a lager beer. While Baeren Apple Lager was crisp and dry in the body, the apple flavour was muted compared to the malty caramel flavour going on. It seems weird to put a fruit with complimenting flavours, such as apples, into a beer when it will be dominated by other flavours. There was a hint of floral hops as well but by that time, Baeren Apple Lager had been forgotten and drunk and the next beer ready for drinking. Baeren Apple Lager isn’t a waste of apples or malt as it is drinkable, but it is simply too bland and boring to get excited about.